Activated Carbon Granules Coconut Shell offered by us are manufactured using coconut shell, wood or coal. These are prepared by the activation process with the help of steam and myriad of pores with large internal surface area. Our range of activated carbon granules is used in packaging applications. 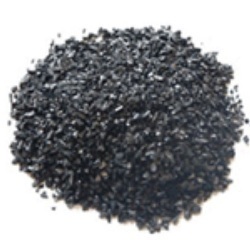 We are Bulk Suppliers of Activated Carbon granules of I.V 300 to 1000, if you have any requirement then please contact. Purification of oils, fats, alcohol, soft drinks, coloring agents, Removal of taste, odor and micro pollutants such as pesticides from drinking water. Owing to our huge market knowledge, we have been able to serve our valued clients with a wide range of Activated Carbon Granules. This type of activated carbon is used for vapour phase applications mainly solvent recovery. It is also used for making activated carbon catalyst due to its large surface area and hardness. With an aim to cement our reputation in this domain, we are occupied in offering Activated Carbon Granules. As a quality focused firm, we are engaged in offering a high quality range of Activated Carbon Granule.